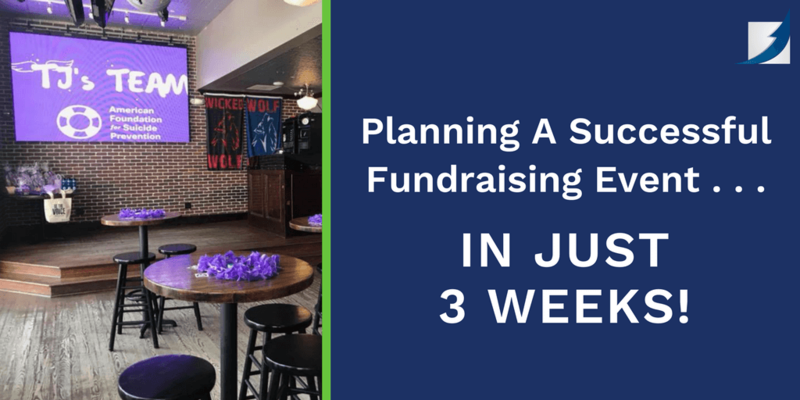 Planning A Successful Fundraising Event . . . in Just 3 Weeks! As a Senior Consultant for The Munshine Group, I have the privilege of working alongside individuals who are impacting the world for the better, as employees and volunteers of their respective nonprofit organizations. I often feel inspired working in this field, but I recently had an experience that left me feeling even more invigorated than usual. I had the opportunity to work with an organization not as a consultant, but as a volunteer. This spring, I co-hosted a fundraiser for the American Foundation for Suicide Prevention. It’s a cause that means a lot to me because one of my friends from high school, TJ, took his life when he was 16. Then, in college, I lost another friend to suicide. Unfortunately, suicide has become the second leading cause of death among individuals between the ages of 10 and 34 (CDC 2016). It’s an epidemic in our society that needs to be addressed. 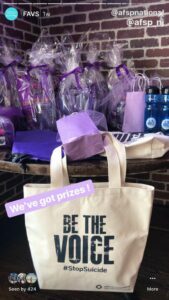 Prompted by an AFSP Hike for Hope scheduled for May, my friend and I decided to host a fundraiser at a bar in Hoboken, NJ and appeal to friends and families from our hometown. The money raised would be donated to our AFSP peer-to-peer fundraising page for the hike. Because of our conflicting schedules, there was only one date that would work and we only had about three weeks to pull it together. 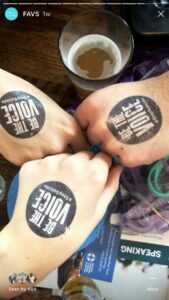 We secured the date and time with a bar and we began strategically contacting people from our hometown, getting them on board as ambassadors for the event. We created a private Facebook event page and invited all the ambassadors before making the page public, so it would look like the event would be well attended as soon as it was changed to public. That was a mistake- Facebook has apparently changed its rules, so event hosts can no longer change an event from private to public. I had to create a new event and delete the old event, which confused everyone. It didn’t go as planned, but it worked out. We asked for a $20 minimum donation at the door, but encouraged people to donate/register in advance through our AFSP online giving page. If donors gave more than $40 or $100, they received a gift for their giving level (the gifts were generously donated by a sponsor). AFSP and TJ’s family supplied us with a bunch of other prizes which we decided to raffle off. We also had fun giveaways for everyone in attendance — leis, temporary AFSP tattoos, pins, etc. We were determined to keep the mood light and fun, even though the reason for gathering was not. Considering this was our first fundraising push for AFSP and we had no idea what to expect from our peers, we set what we thought was an ambitious yet achievable goal of $1,500. Incredibly, 24 hours after launching the event page we surpassed our initial goal, so we increased it. Then, we surpassed the new goal, and the next goal after that! We hit about $7,000 with a few days to go, so we decided to go for $10,000. In the ten days leading up to the event, we assigned each day to one of our ambassadors and asked them to post a countdown photo and a few sentences to the event page. I think this really helped to build momentum and get people excited. About halfway through the actual event, we were only $210 short of our $10,000 goal. We made an announcement and encouraged guests to purchase raffle tickets to help us reach our goal. More than 75 people attended and we ended up raising $2,551 on-site and $11,262 in total. 1. I was astonished by the generosity of young adults… and I underestimated them. Only a few years into their careers, many are working to pay off student loans and are paying high rent in or near NYC. As our team at The Munshine Group has discussed, millennials will give when they believe in the cause (The Millennial Impact Report). Young adults might be moving away from affinity giving, but they have no problem opening their wallets for something they’re passionate about. 2. Ambassadors are essential. I don’t think this would have worked had we not locked in those key individuals early on. The ambassadors were our eager, first-in participants who spread the word, created their own fundraising pages, and helped us out with giveaways and the countdown. 3. Don’t underestimate the power of the pitch (and the cause). Our event attendees only filled about half of the bar, so there were plenty of people who just happened to be stopping by for lunch or a drink at the same time. 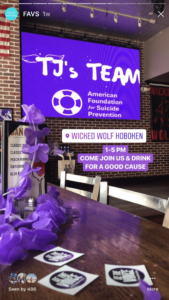 We put the AFSP and TJ’s Team logos on a big screen, made a few announcements throughout and read a message from TJ’s mom thanking everyone for being there. After we announced that we were only $210 short of our goal, someone not even registered with our event, walked up and handed us the $210. And that’s not the only time something like that happened. There were people all afternoon who just happened to be there, heard our story, felt touched by the cause and decided to donate. Overall, it was a GREAT day. We left feeling like we just started an annual tradition and set a standard for years to come. As nonprofit consultants, the work my colleagues and I get to do each day is pretty special. However, there’s something increasingly rewarding about doing that same work off the clock, as a volunteer. I’m glad I was able to take my professional skills and apply them to raise funds for a cause I care so much about. Plus, now I know— special fundraising event in just three weeks time? No problem! Heather Wolf is a passionate go-getter, dedicated to assisting nonprofit organizations reach their highest potential. Her experience in donor relations, alumni relations, annual funds, and major gifts contributes to her knack for nonprofit consulting. Heather has planned and executed numerous special events from intimate major gifts dinners to large annual galas and auctions.